In common usage, “boundless” is often used as a synonym for “infinite”. But of course the two words represent two quite different properties and, I think, are unnecessarily conflated: to the detriment of both language and understanding. I generally assume “infinite” to apply to quantifiable or countable (i.e capable of being counted) things, whereas I take “boundless” to apply to both qualitative concepts and “countable” things. “Infinite” is thus of a lower order than “boundless” since it can be applied only to the subset of “countable” things in the set of all things. “The infinite” is patently impossible since the application of the definite article can only apply to the finite. Of course, “the Infinite” is often used to describe “the divine” which only serves to illustrate the paradox inherent in divinity. So I sometimes find the use of “infinite” as an adjective a little grating. A specific number is not “countable”, it is itself the “count”. So I find the use of “infinite numbers” or “infinite sets” somewhat misleading. Each and every number or set of numbers is – and has to be – finite. It is only the number of terms in the set which may be infinite. Each set once specified is fixed and distinct from any other set. It may contain an infinite number of terms but the set is finite. You could also say that such a set “extends to infinity” or that the set is “boundless”. The number of such sets can also be said to be infinite or boundless. The distinction between boundless (or endless) and infinite is of no great significance except when the two properties need to be distinguished. 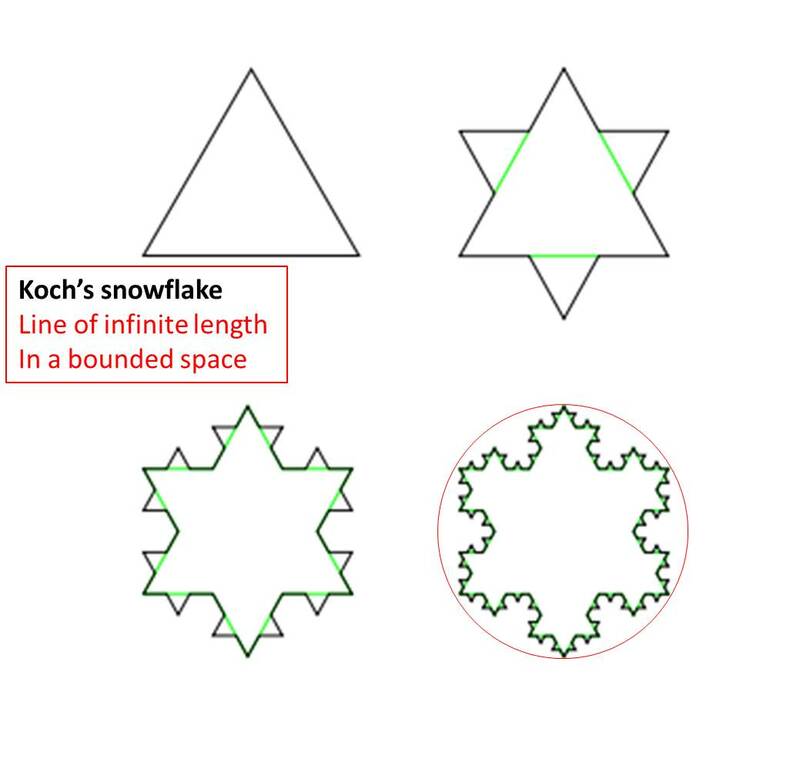 For example, the Koch snowflake is an example of a set of lines of increasing length being drawn within a bounded space. It is only the length of the line – being quantifiable – which tends to the infinite with an infinite number of iterations. Note that every iteration only produces a line of finite length but the number of terms in the set is infinite. The Koch curve has an tends to an infinite length because the total length of the curve increases by one third with each iteration. Each iteration creates four times as many line segments as in the previous iteration, with the length of each one being one-third the length of the segments in the previous stage. Hence the length of the curve after n iterations will be (4/3)n times the original triangle perimeter, which is unbounded as n tends to infinity. I am told that the universe is expanding and may be infinite but bounded. Or it may be infinite and boundless. Or it may be finite and bounded. Whether the universe is infinite is a different question to whether it is bounded. In fact the term “infinite” can only be applied to some quantifiable property of the Universe (its mass, its diameter, its density, the number of stars or galaxies it contains …), whereas its boundedness can be applied to any qualitative or quantitative property. In one sense the universe where we assume that the fundamental laws of nature apply everywhere must be bounded – if nothing else – at least by the laws of nature that we discern. If space has negative curvature, there is insufficient mass to cause the expansion of the universe to stop. In such a case, the universe has no bounds, and will expand forever. This is called an open universe. If space has no curvature (i.e, it is flat), there is exactly enough mass to cause the expansion to stop, but only after an infinite amount of time. Thus, the universe has no bounds and will also expand forever, but with the rate of expansion gradually approaching zero after an infinite amount of time. This is termed a flat universe or a Euclidian universe (because the usual geometry of non-curved surfaces that we learn in high school is called Euclidian geometry). If space has positive curvature, there is more than enough mass to stop the present expansion of the universe. The universe in this case is not infinite, but it has no end (just as the area on the surface of a sphere is not infinite but there is no point on the sphere that could be called the “end”). The expansion will eventually stop and turn into a contraction. Thus, at some point in the future the galaxies will stop receding from each other and begin approaching each other as the universe collapses on itself. This is called a closed universe. A universe with some infinite property in a bounded space only begs the question as to what lies in the space beyond the bounds. It also occurs to me that an endlessly expanding universe has to first assume that empty space – which should contain nothing – must actually contain the property of distance. That too is a bound, for if space did not even contain the property of distance, any expansion would be undefined. (And what does distance mean between two points in truly empty space?). Imagination can be boundless – rather than infinite – and can even extend beyond the bounds of what we can perceive. In reality even our imaginations are often bounded by the limitations of our modes of expression of language and music and painting. Our emotions can be said to be boundless though they too are bounded by physiological limits. A bounded universe of boundless infinities it would seem, rather than one of infinite infinities, and certainly not one of infinite boundlessnesses. This entry was posted on May 23, 2015 at 9:31 am and is filed under Mathematics, Philosophy, Trivia. You can follow any responses to this entry through the RSS 2.0 feed. Both comments and pings are currently closed. The simple answer — nothing. That is to say there is no space beyond as there is no time there. Without time there is no space! I have to keep remembering that “space” is not “nothing”. Space – as I see it – has at least the property/attribute of distance (allowing the passage of light and subject to a concept of time). The non-properties (the complete absence of all properties or attributes) of nothingness challenges the mind. It cannot even be a concept since a concept would itself then be “some thing”. I always end up with a circular argument. “Nothing” is no thing – neither physical nor abstract. It cannot be conceptualised without becoming some thing. It has no properties and no attributes. No thing is nothing. Therefore nothing is no thing.